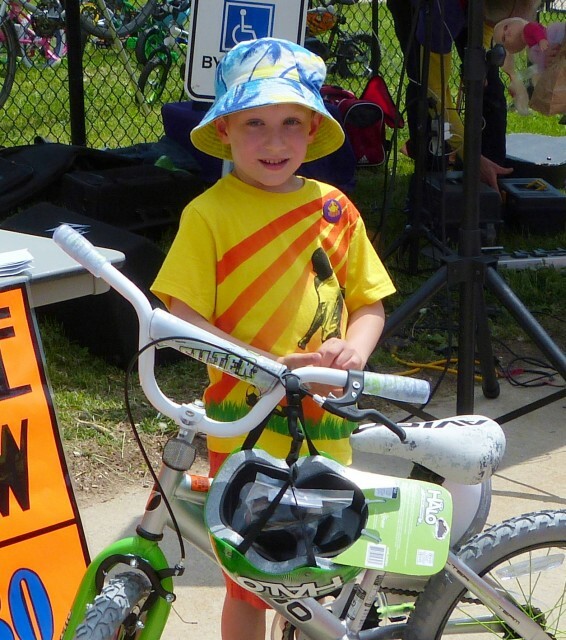 PHOTO: The winner of the bicycle (Junior Division) at the 2016 Bike Rodeo, shown with his new bike & helmet, Michael Kearsey. Congratulations! The Stanley Park Optimist Club has been holding an annual bike rodeo since 1985. While the location has changed several times over the years, interest has not and the event now draws 150 - 400 participants (depending on the weather!) Usually there are refreshments for all participants, gifts & lucky door prizes, bike safety checkups/tuneups, entertainment by Erick, face-painters and lots of fun - all at no charge through the courtesy of the Optimist Club of Stanley Park, donations and sponsorship from local businesses and, for the last several years, in collaboration with the Stanley Park Community Centre. We thank the Centre's staff and volunteers for helping to enhance this annual event and, certainly as of 2018, stepping forward to assume the organizing and hosting responsibilities. (Our Club no longer has the manpower nor finances to do the event justice but will carry on helping with it .) May there be many more rodeos! The 2018 Rodeo was held Saturday, June 9 at the Stanley Park Community Centre (Ottawa St. N. at Franklin by St. Daniel School. It was held in conjunction with a ball hockey event organized by the Stanley Park Community Centre and ran later into the afternoon than in previous years. Play safe, ride safe and see you the next rodeo - it's all FUN! "When and where is the Bike Rodeo for this year?"